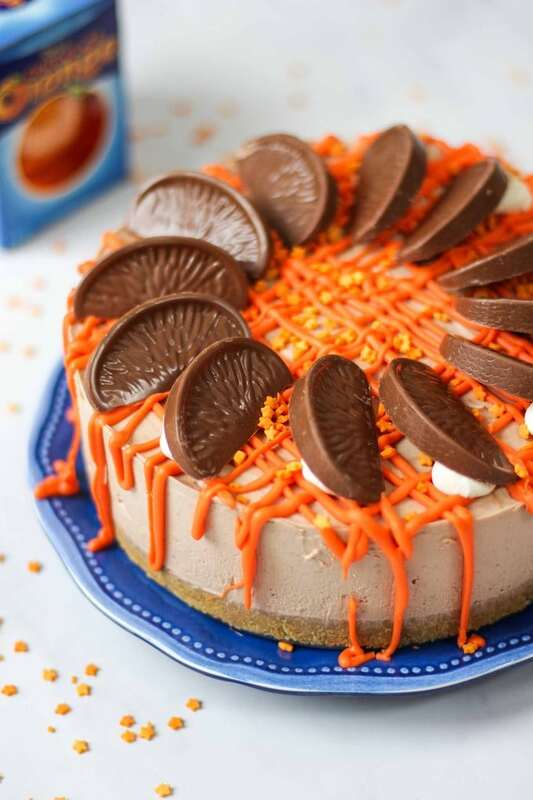 Chocolate Orange Cheesecake - The Easiest No Bake Recipe! A really easy No Bake Chocolate Orange Cheesecake recipe – Packed with the flavour of Terry’s Chocolate Orange, perfect for Christmas dessert, holidays pudding or any time of the year! Made with cream cheese, without gelatine and easily made gluten free. Oh my goodness, how is it NOVEMBER already? We moved house a few weeks ago and the unpacking and chaos that has ensued (no heating or hot water – ARGH!) has left me mostly dreaming of Christmas to distract myself. As a foodie, what we will eat is always top of my priority list and this year is no exception. I’ve made and posted so many cheesecakes on this blog over the years, I cannot believe that I’ve never made a festive Christmas version. I decided to put that right and so, this is the first of three coming your way over the next couple of weeks. I think the key to these cheesecake recipes is that they are all based on my basic recipe and they really are super simple. Anyone can make them. I hope you like this one as much as we did! 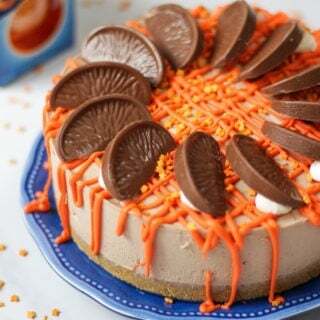 How do you make a Chocolate Orange Cheesecake? Make a simple biscuit base with crushed digestive biscuits and then top with the deliciously light and creamy filling. This Chocolate Orange Cheesecake uses whipped double cream, icing sugar, cream cheese and melted chocolate oranges. When the cheesecake is set, decorate with with melted white chocolate coloured orange using gel colouring, more cream and chocolate orange segments. Super easy and so yummy. Everyone will love it. 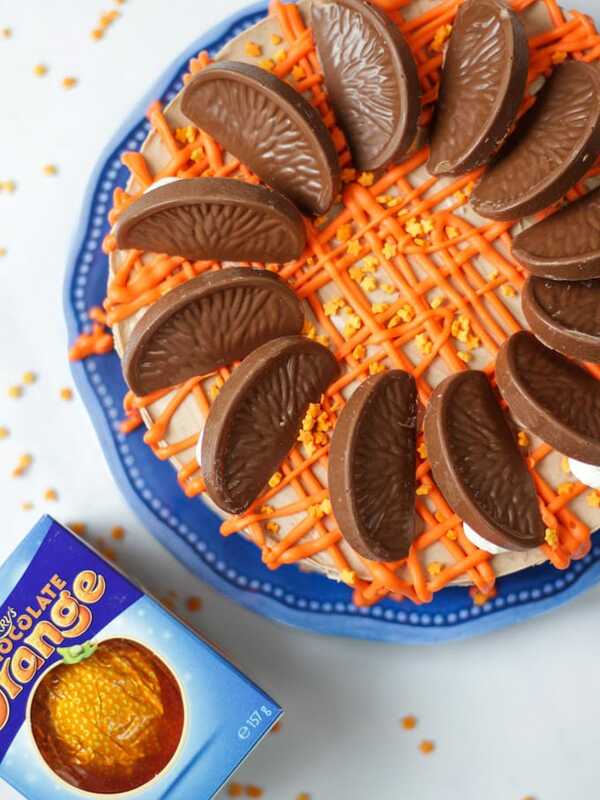 What is the best tin to make the Chocolate Orange Cheesecake in? You can use smaller or larger tin or a different shape, but your cheesecake will obviously be taller or shorter. I would DEFINITELY recommend this tin though as it is a great size and very easy to use. 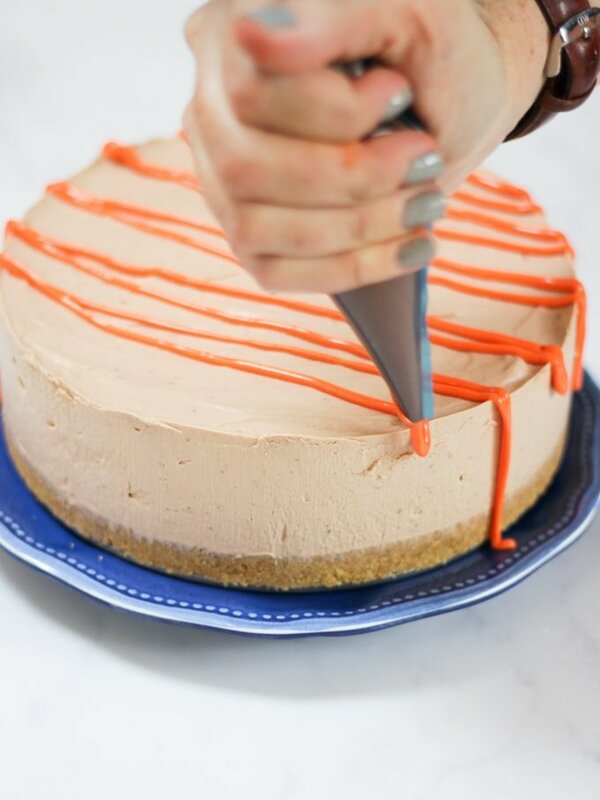 How long do you need to chill a No Bake Chocolate Orange Cheesecake for? 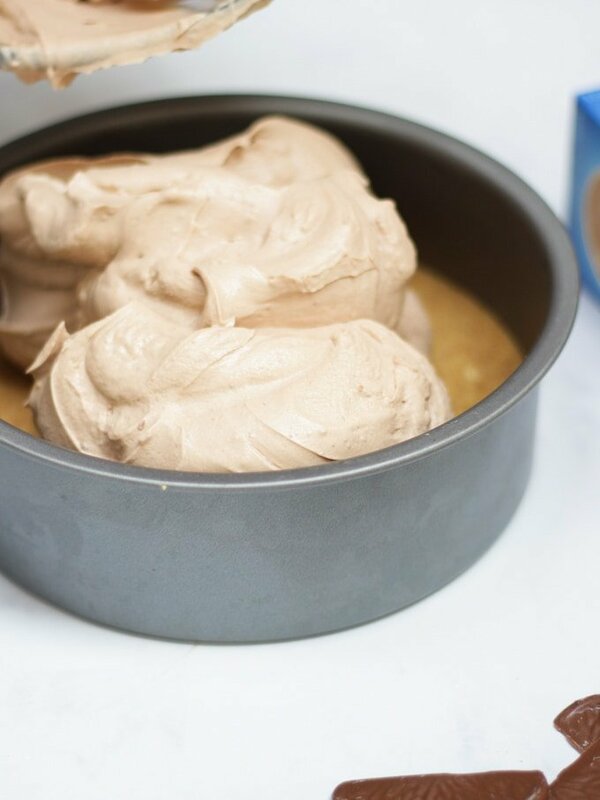 A No Bake Cheesecake needs to be chilled in the fridge for at least 4 hours, or ideally overnight. If you’re in a rush you can pop it into the freezer for 2 hours, and then allow 20 – 30 minutes to come to room temperature before serving. This is fine, but the consistency is a little less predictable than when chilled slowly. 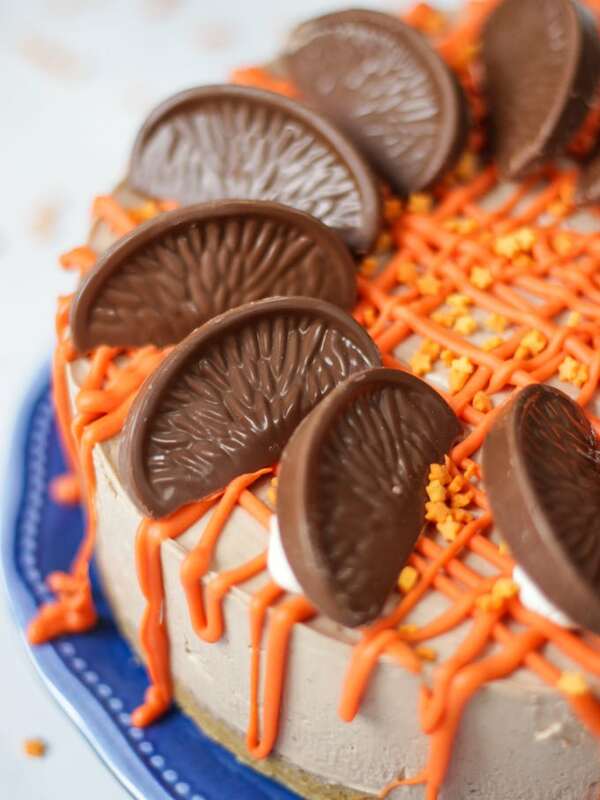 How do I make a No Bake Chocolate Orange Cheesecake gluten free? If you’d like to make this recipe gluten free, just substitute in gluten free digestive biscuits instead of standard ones. Terry’s chocolate oranges don’t contain gluten but they are made in a factory that uses gluten so there may be contamination. To avoid the risk altogether you could use your favourite gluten free chocolate brand and double the amount of orange essence used. 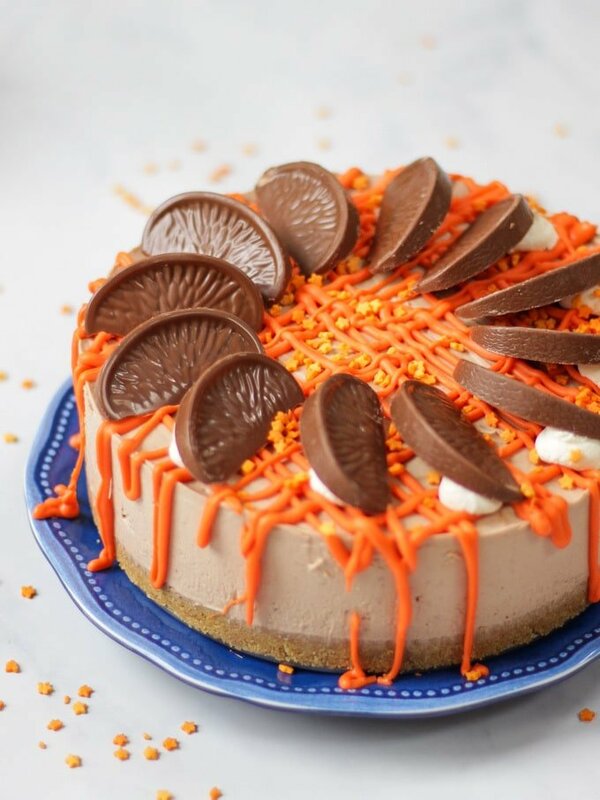 How do I colour the chocolate to top the No Bake Chocolate Orange Cheesecake? Of all of my cheesecake recipes, any that use coloured white chocolate, this is the question I get asked most often. Firstly, you don’t need to do this step if you don’t fancy it or don’t have the food colouring, it’s just decoration. However, if you are going to do this step, PLEASE only use gel colouring like this one: Sugarflair Gel Food Colour in Tangerine shade on Amazon. Anything else always causes a disaster! This paste is so thick that you only need a little and it doesn’t cause too many problems with the chocolate. Still, the chocolate can sometimes ‘seize‘ and go kind of super thick and lumpy. If it does this, just add a few drops of vegetable oil and beat well. Add more if needed, a little at a time, until the chocolate is smooth again. The consistency of this no bake cheesecake should be sliceable but not solid. Something like room temperature butter, it will give a little quiver if you wobble it gently. When whipping the double cream, be sure to watch it very carefully. It should be just forming soft floppy peaks, but still hold it’s shape. Too runny and the no bake cheesecake will be sloppy, too stiff and it will be too dense. Do sift the icing sugar, it will give a much smoother texture to the cheesecake. Don’t ignore this as I normally do! The recipe is for a 7″ tin which is also DEEP (not a standard sandwich cake tin, it will overflow! See the link below for the type of tin I use). You can use smaller or larger but your cheesecake will obviously be taller or shorter. I would DEFINITELY recommend this tin though as it is a great size and very easy to use. Chocolate Orange Cheesecake too runny and won’t set? It’s probably because your cream wasn’t whipped quite enough. No problem, pop it into the freezer for a few hours before serving. This is the gel food colour I used to colour the chocolate: Sugarflair Paste Colour – Tangerine. Only ever use Gel Food Colour to colour the chocolate. Liquid food colour will make it too thin. If the melted white chocolate seizes (i.e. goes too thick) add a small amount of vegetable oil and keep stirring until it returns to the correct consistency. Allow the chocolate to cool slightly before drizzling to avoid ‘melting’ the cheesecake. You’ll also get neater lines as slightly cooled chocolate doesn’t spread so easily. For a neater chocolate drizzle, use disposable piping bags for each colour of chocolate. Just snip the end off to pipe. I use these: Savoy Disposable Icing Piping Bag . I know, these are not great for the environment. But using reusable bags takes so much detergent to get them clean, I’m honestly not sure of the best option. You can make a simple little bag from baking paper but they are a little more tricky to handle. Fancy some other easy cheesecake recipes? How about my No Bake Nutella Cheesecake or my No Bake Rocky Road Cheesecake? Hope you enjoy this recipe as much as we do. 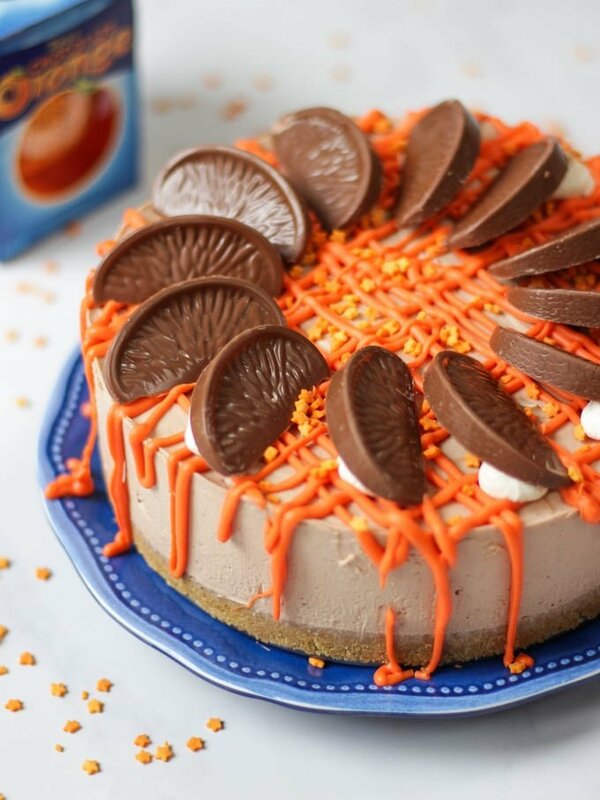 I’d love to know how you got on and what you thought of it if you make this No Bake Chocolate Orange Cheesecake recipe. Please rate the recipe and leave me a comment below if you do. A really easy No Bake Chocolate Orange Cheesecake recipe - Packed with the flavour of Terry's Chocolate Orange, perfect for Christmas dessert, holidays pudding or any time of the year! Made with cream cheese, without gelatine and easily made gluten free. Mix with the melted butter and press into your 7" tin. Gently melt the 2 Terry's Chocolate Oranges in a glass bowl over a pan of boiling water. Stir until smooth and then put to one side and allow to cool for 5 minutes while you get on with the next step. Combine the whipped double cream, cream cheese, icing sugar, lemon juice and orange essence (if using). Fold in gently until fully combined. Add the cooled melted Chocolate Oranges and stir thoroughly. Smooth on top of the biscuit base and flatten the top with the back of a spoon or a palette knife if you have one. Put into the freezer for 2 hours, fridge for four hours, or leave over night if you are not in a rush. Bring out of the fridge, remove from the tin. Melt your white chocolate in a glass bowl over a pan of boiling water, colour the white chocolate with a tiny amount of gel colouring and allow to cool very slightly before drizzling over the cake in zigzags. Pipe remaining whipped cream and decorate with Chocolate Orange segments. is that 2 boxes of the orange chocolate in the cake or 2 slices? The recipe calls for two chocolate oranges, and states to melt two choc oranges for cheesecake, but then states to decorate with orange slices. So is this 3 chocolate oranges, and not two? Hi Doreen, it depends where in the world you are, I think in the USA it’s called heavy cream. Hope that helps. Thanks for letting us know this Marion, we will change the post to reflect that.